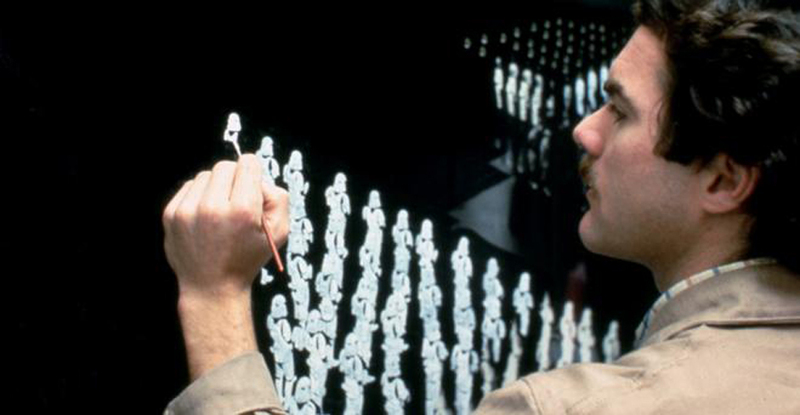 Most of the vast legions of Stormtroopers are created utilizing matte paintings. 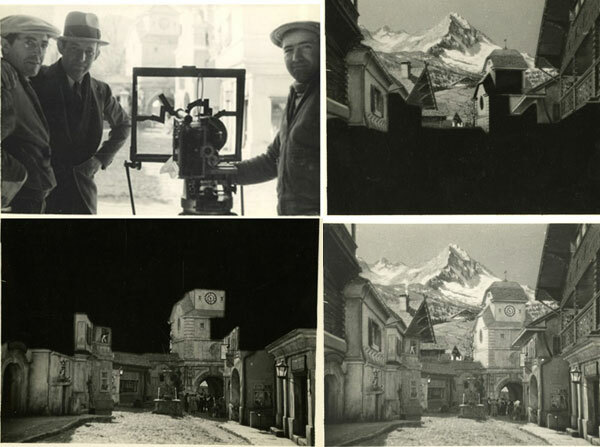 A matte painting is a painted representation of a landscape, set, or distant location that allows filmmakers to create the illusion of an environment that is nonexistent in real life or would otherwise be too expensive or impossible to build or visit. 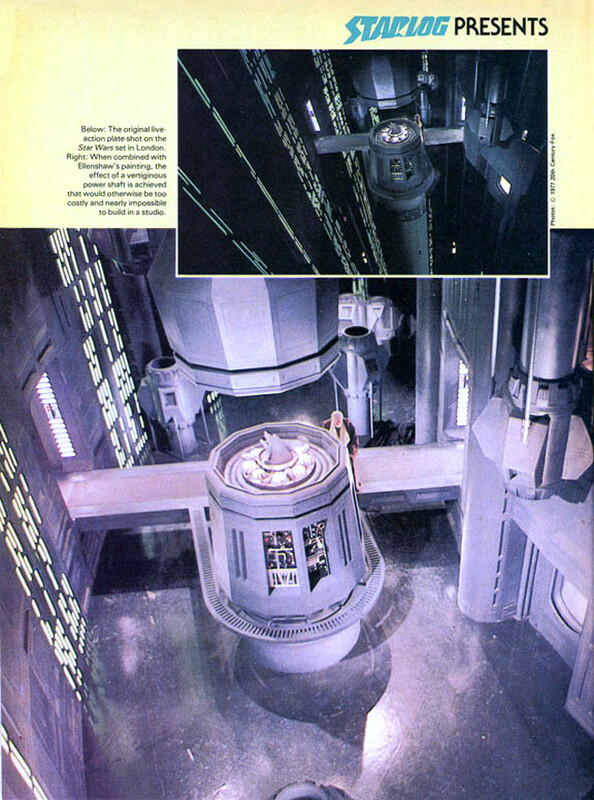 Historically, matte painters and film technicians have used various techniques to combine a matte-painted image with live-action footage. At its best, depending on the skill levels of the artists and technicians, the effect is "seamless" and creates environments that would otherwise be impossible to film. Here is a finished one. If you look closely, you can see a "black" area near the shuttle. That's a clear spot on the glass where the live action would be filmed through. 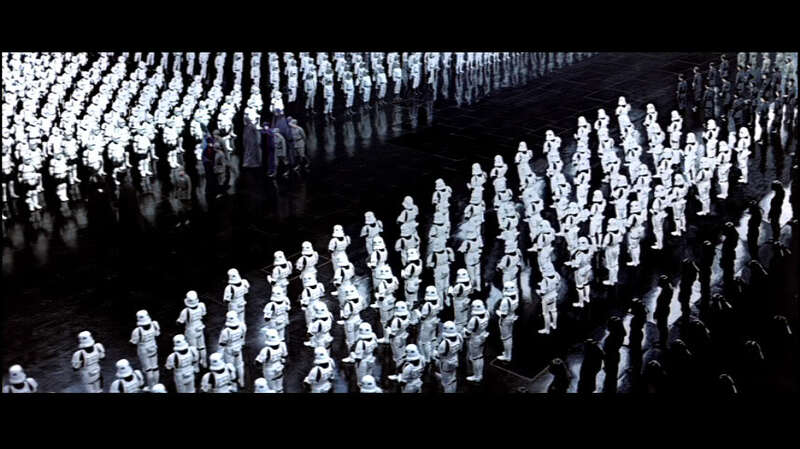 Watch closely in scenes where there are large groups of troops, and you'll notice that only those closest to the action ever actually move. That's because they're the only ones that were real actors. Norman Dawn developed a technique that joined together a Photograph and a Painting to enhance the environment that is being shot by the camera (Wikipedia). 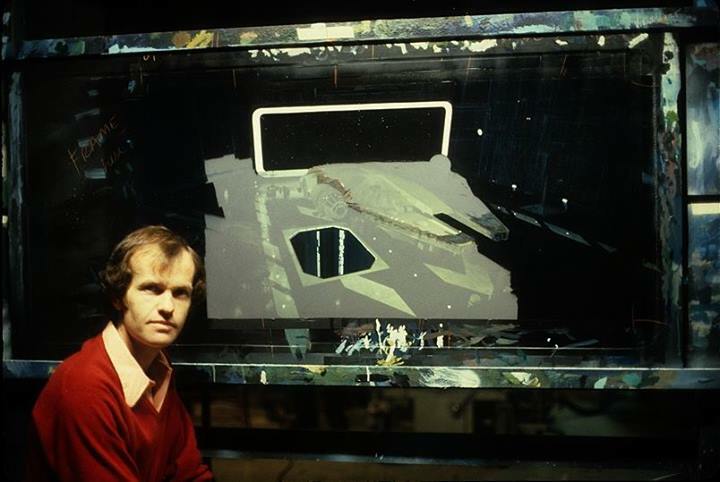 Dawn, a photographer himself, took his photos and paintings and placed them on a large sheet of glass. Black tape was then placed over the parts of the camera where the painting would go. 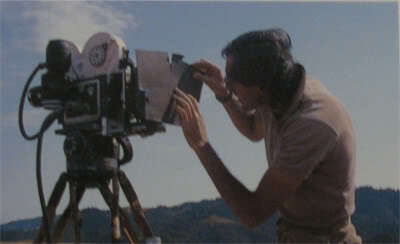 After the camera was positioned properly the live action scene would take place. What resulted was a union between a simple painting and actual live scenery. 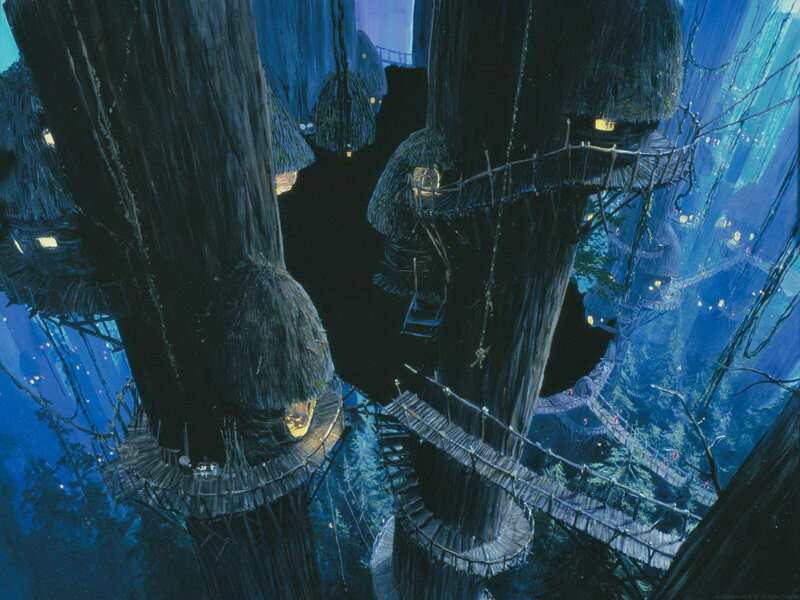 Did you really think they built a village in the trees? Let's put it all together to see what it looks like. I haven't actually read anything from an actual Stormtrooper, but based on what I have read and heard, I imagine it was the typical process for being cast as an non-featured role: know someone or get the job through the standard extra casting process. Did you have to audition for Boba Fett? Having gone through the extra-casting process myself in the past, typically casting agencies are provided general descriptions of roles/groups they're looking for. Each candidate either provides a few basic photos, or comes in for them (as I had to). Those who fit the descriptions may be called in for fittings or readings if necessary. In my case, I was chosen solely on my appearance since it was for "deep background" where I would only be yelling and looking angry (for Pirates of the Caribbean 2 and 3). For roles like Storm Troopers and most Rebels, a similar process would have occurred. 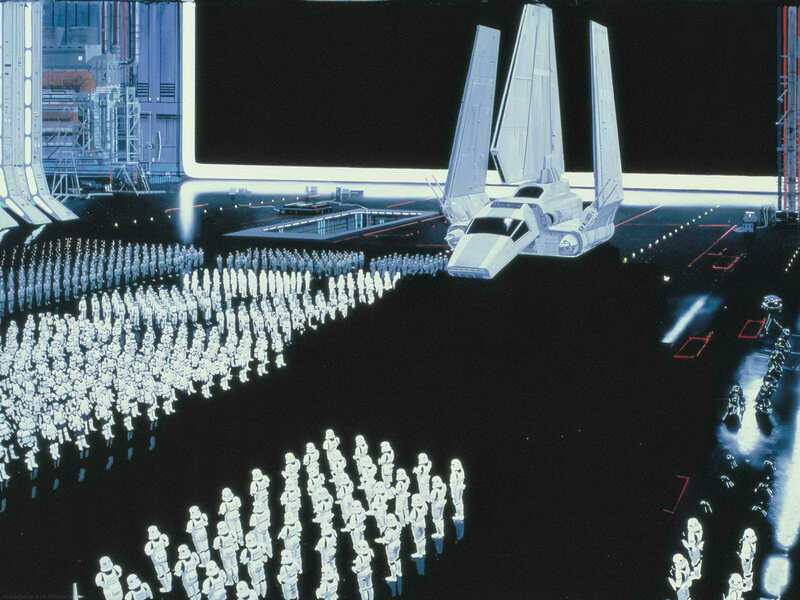 In addittion to matte paintings, cardboard figures were also used, notably in the hangar scenes in Return and the ceremony at Yavin. If you have the old editions, you see this if you look for it, but I'm pretty sure this was replaced in the newer, more CG versions. Edit: Here is a link to two photos from the award ceremony at forum.blu-ray.com. However, it is easier to see in the film as the cardboard cutouts are 100% stationary whilst live actors usually move somewhat no matter how still they should be (and CG characters usually move more unnaturally). They were all supplied by Central Casting in London, akin to it's sister union in LA.This agency no longer exists.I was one of the originals. Not the answer you're looking for? Browse other questions tagged star-wars actors actor-identification or ask your own question. Where is the image suggesting sub-title meanings for each Star Wars flm?